I love autumn on the farm, but I’m not here much this time of year, which makes it that much sweeter when I am. I live in Oregon (born and raised). 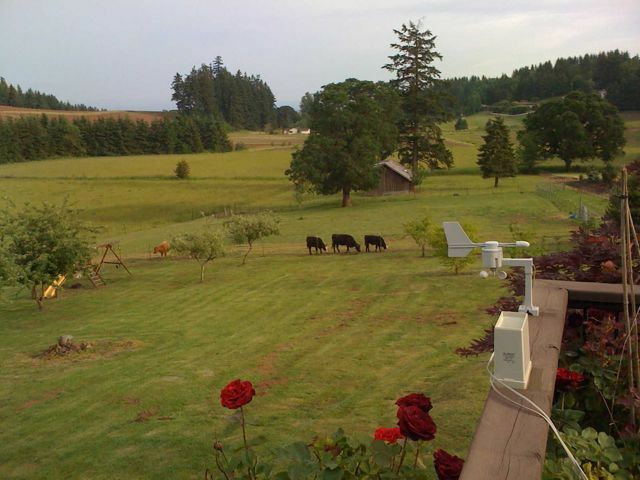 My wife, Marie, and I have a small farm twenty minutes south of Portland. The farm is 35 acres. (We co-own 30 acres of the farm with Marie’s sister and her husband). There are two houses on the farm. One for them, one for us. My brother-in-law raises a few beef cattle and hay. One of our nieces keeps a horse here. We have two barn cats. In the spring Marie’s mother puts in a big vegetable garden. About 8 o’clock every evening a cool breeze blows up our little valley and makes us smile. The farm is a gathering place with family and friends constantly coming and going. Our house is never empty, even when we’re away. This makes us happy too. It would be a shame to have a place like this without someone here to enjoy it. Marie was raised on the farm and has been here for 40 years. I’ve been here nearly twenty years. It’s a wonderful place to write. What was your family like? Did you have any brothers or sisters, and did you have any pets? Everything I want you to know about can be found on this webpage. hi im doing a report on you!and i was wondering if you had any pets? No pets….at the moment. We’re away from home too much to have pets. Im doin a project on you and i need more of your family information. Everything you need to know about me can be found on my web page. where did u go 2 college @ ??? I can’t find if you have a sister or brother. Do you have any?